It’s time for the playoffs! Or, you know, the time things get awfully intense — even off the track. Chicagoland gave us plenty of story lines … and slime. There’s something special about seeing those 16 playoff cars with Monster Energy green trim. Heading into Chicagoland, Joe Gibbs Racing elected to swap pit crews for their No. 18 and No. 19 teams. Kyle Busch, of course, made the playoffs, while teammate rookie Daniel Suarez came up short in his first season. Apparently, Suarez’s No. 19 crew was the safer bet — that was the assumption, at least — prompting a swap of the teams before the start of the playoffs. Apparently, after numerous pit road penalties and mishaps for the No. 18 team, the swap didn’t quite go as planned. Busch led the most laps, but ended up finishing 15th. Not ideal when every point matters. It remains to be seen whether or not Kyle Busch will be reunited with the pit crew that helped him reach the playoffs, but surely the team competition meeting on Monday totally wasn’t awkward at all. Thumbs down for a rocky start. Why isn’t anybody talking about the photo finish at Chicagoland?! Matt DiBenedetto crossed the finish line side-by-side with race winner Martin Truex Jr — a dead heat — or so it appeared. No, the No. 32 Go Fas Racing Ford didn’t battle for the win, but it’ll sort of look that way in every photo of Truex crossing the finish line at Chicagoland Sunday. DiBenedetto’s lapped car finished six laps behind Truex in 31st place — but, hey, maybe he could fool somebody in a sponsor pitch deck. Thumbs up to DiBurrito for almost winning, from the looks of it, at least. Pish! Piles of playoff participants procured plentiful pit road penalties. Playoffs produced plenty of pressure, piling prevalent penalties for particular playoff partakers: Ricky Stenhouse Jr., Martin Truex Jr., Austin Dillon, Kyle Busch, Jamie McMurray, and Kurt Busch were the proscribing parties participating in the Playoffs pained by pit road penalties. Truex positively parried his pit penalty, per contra, prevailing powerfully and passing to the postliminary playoffs period. Thumbs down for playoff participators performing pass-through pit road penalties, per prescribed protocol. Did you have grandparents who kept the plastic covers on their furniture? Man, it seems like you couldn’t enjoy the furniture at the intended level of comfort and visual appeal — all in the name of keeping dirt and slime off the furniture. Maybe sofa-plastic grandparents were afraid of people like Martin Truex Jr. The Furniture Row Racing driver and his team were greeted in Victory Lane by a heaping helping of Slime. As we noted, there was a little more green on Truex’s car this week coinciding with the start of the playoffs, so it was only fitting that Truex himself sported some more bright green of his own when he claimed the victory in the Tales of the Turtles 400 (with race partner Nickelodeon). 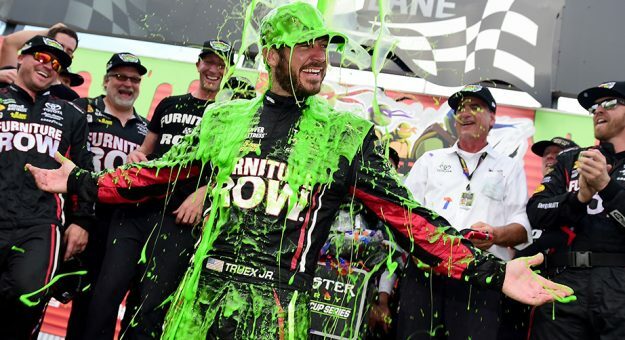 Surely, crew chief/engineer/genius Cole Pearn’s already working up a use for the Slime. A giant thumbs up for sliming the furniture race winner. Let’s do this again.